Delicious and filling, this Instant Pot Wild Rice Bowl is a comforting weeknight meal that won’t heat up your kitchen in the summer months. 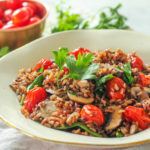 Full of warm-weather flavors like baby spinach, burst sweet cherry tomatoes, and the addition of umami flavor from mushrooms. 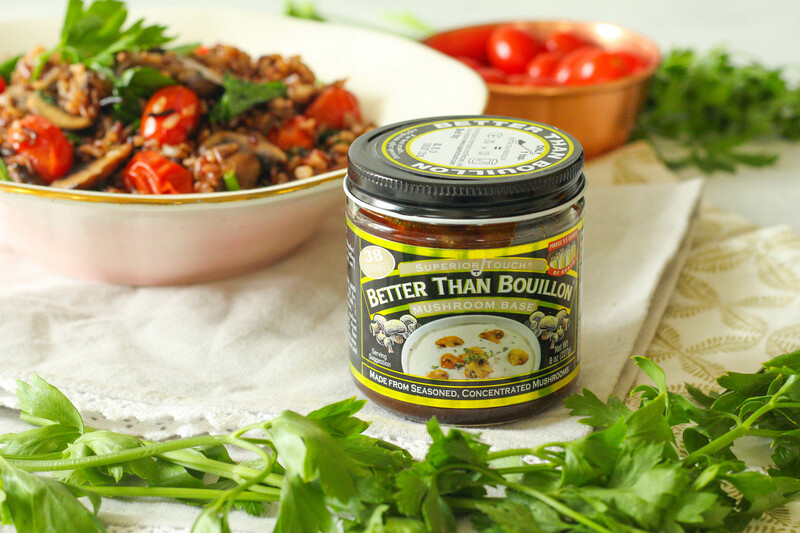 This post is sponsored by Better Than Bouillon. Thanks for supporting brands that make Zen & Spice possible! During the summer months, I try to cook meals that won’t heat up my kitchen. Baked dishes get sent to the back of my recipe repertoire. Although we’ve had a “cold front” the past week (in the low 90s!) here in Dallas, August is known for being anywhere from 95 to 115 degrees here in Texas. The Instant Pot is a great kitchen tool to use in the summer for that very reason. It cooks food wonderfully yet won’t heat up your kitchen. Today I’m sharing how I use my Instant Pot to cook wild rice to create a delicious, savory instant pot wild rice bowl. I’m partnering up again with one of my favorite pantry staples: Better Than Bouillon! A couple of weeks ago, I shared my recipe for Instant Pot Chicken Tostadas made with BTB’s chicken base. The chicken, beef and vegetable bases I keep in my fridge at all times. But, did you know they have a ton of other flavors, including this mushroom base? If you’re not familiar with BTB — it’s a concentrated stock paste that you reconstitute with water to create the exact amount you need for a recipe. That’s the main reason I love BTB. Before discovering this product, I would buy cartons of broth and only use half for a recipe, and stick it in my fridge never to be used again. Sure, I could freeze the broth into ice cubes, but who really has time for that (or the space in their freezer?!). BTB is great as a broth, but you can also use it to sautee. I’m using both methods in today’s recipe. 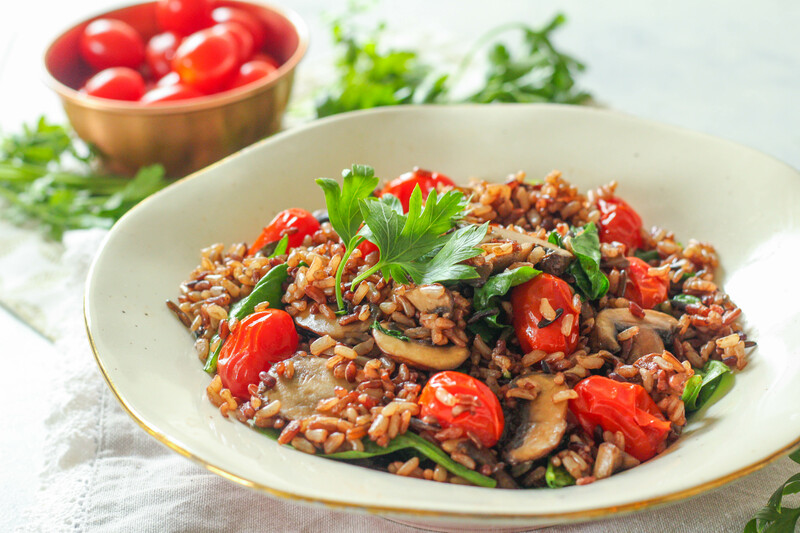 The wild rice blend is cooked with the mushroom base + water in the Instant Pot. The veggies are sauteed over the stove-top while the rice is cooking along with another dollop of mushroom BTB. Adding a smidge to the sautee mixture gives the veggies a rich umami flavor (no need to add any additional salt!). 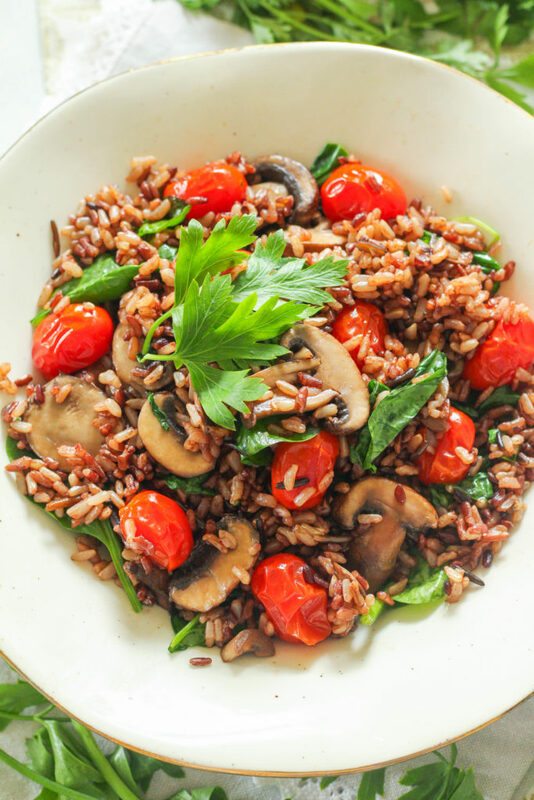 I just love the pop of color in this instant pot wild rice bowl from the burst cherry tomatoes and the baby spinach. Burst cherry tomatoes are a magical thing — you simply cook cherry tomatoes over medium-high heat until they begin to blister and pop, which makes them very sweet and soft. They release their juices and create a flavorful, aromatic sauce. 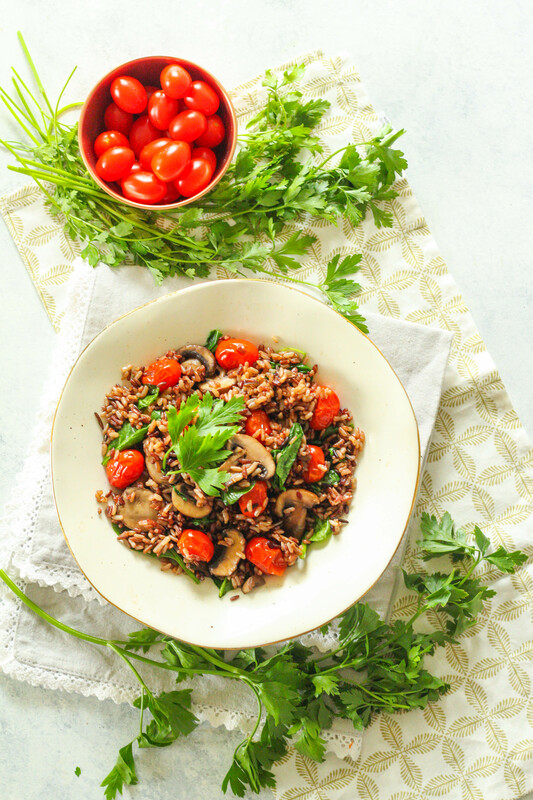 Delicious and filling, this Instant Pot Wild Rice Bowl is a comforting weeknight meal that won't heat up your kitchen in the summer months. Full of warm-weather flavors like baby spinach, burst sweet cherry tomatoes, and the addition of umami flavor from mushrooms. Add the rice blend, water, and 1 tsp of Better Than Bouillon Mushroom base to the Instant Pot. Set on manual for 28 minutes. Use quick release. Meanwhile, In a medium skillet, add the butter and olive oil over medium-high heat. Add the cherry tomatoes. Let cook for 5-8 minutes, until the tomatoes begin to soften and wrinkle. Add the baby bellas, minced garlic and 1/2 tsp Better Than Bouillon Mushroom base and sautee for another 3-4 minutes (until the mushrooms have cooked down). Remove from heat and drain excess water. Add the baby spinach and toss until slightly wilted. Add the cooked wild rice blend and toss well.